The K&A could be split into two waterway regions with the western end to Froxfield being run from Gloucester and the eastern end managed from London, after CRT announced on 7th December 2017 that it would restructure its management. The K&A Waterway Partnership met CRT Chief Executive Richard Parry earlier this month to try to persuade CRT that running the K&A from two different offices would be disastrous for the canal and the people who live and work on it. Mr Parry heard their case but made no promises. The K&A Local Waterway Partnership is holding its Annual Meeting this Wednesday, 12th November 2014. It will be at Bath Cricket Club, North Parade Bridge Road, Bath BA2 4EX from 7pm to 8.30pm. 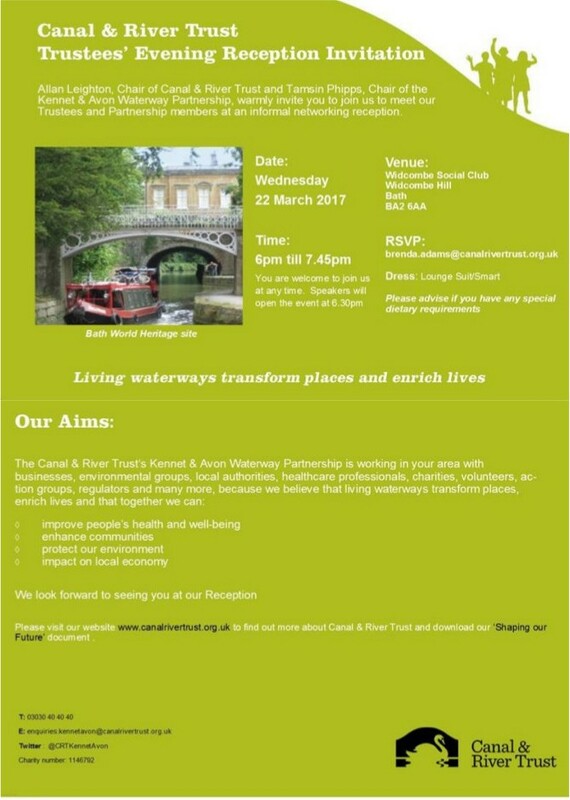 There is an open invitation to this meeting; contact Alison Jordan, alison.jordan@canalrivertrust.org.uk or 01380 737907 if you want to go. It appears that the K&A Local Waterways Partnership has won the argument with CRT about the voluntary nature of the K&A Interim 12-month Local Plan.